SG esports took part in the SA qualifier for The Perfect World Masters. They earned a spot in the Chinese Minor after defeating four different teams. SG esports received a direct invite together with four more teams, skipping the open qualifier. They fought against four competitors in the best-of-three double elimination bracket, never dropping in the losers’ rounds. Their rivals in the Grand Finals were Digital Chaos.SA led by Danylo "KINGRD" Nascimento. DC won the first game, but afterwards SG claimed victory with two well-fought matches. The Perfect World Masters is the first minor based in China, and will take place from November 19 to 26. 10 teams will clash for a $300,000 prize pool. Newbee, LGD.FY, Team Secret received a direct invite. The first match was completely in the hands of DC, that brought down the enemy ancients at 38 minutes with a 24k gold lead. Farith "Matthew" Puente enriched his team with a spectacular use of Bounty Hunter, securing as many as 21 assists. Only some skirmishes took place in the first ten minutes of the second match, but two successful ganks at 11 and 16 minute shifted the game in favour o DC. To counter Legion Commander and Bounty Hunter, both Bloodseeker and Mirana got a Linken’s Sphere. The supports were also forced to get many sentries, dust, and even a Gem of True Sight as they were facing two invisible opponents. Game three was the best one of the series for SG esports. Almost nothing happened in the early game, but at 14 minute they won a decisive teamfight bringing down the entire enemy team. The game was literally a stop and ended 26 to 4. Arc Warden. Guilherme "FuckinEh" Silva contributed to the team’s victory with his Arc Warden: he dominated the mid lane, and by the end of the game obtained a 739 GPM. Team Secret earned a spot for the next ESL Major with an amazing run in the EU qualifier. They totalized 7-0 in the single elimination bracket. Team Secret prevailed in the European qualifier for PGL Open Bucharest with a 6-0 score. 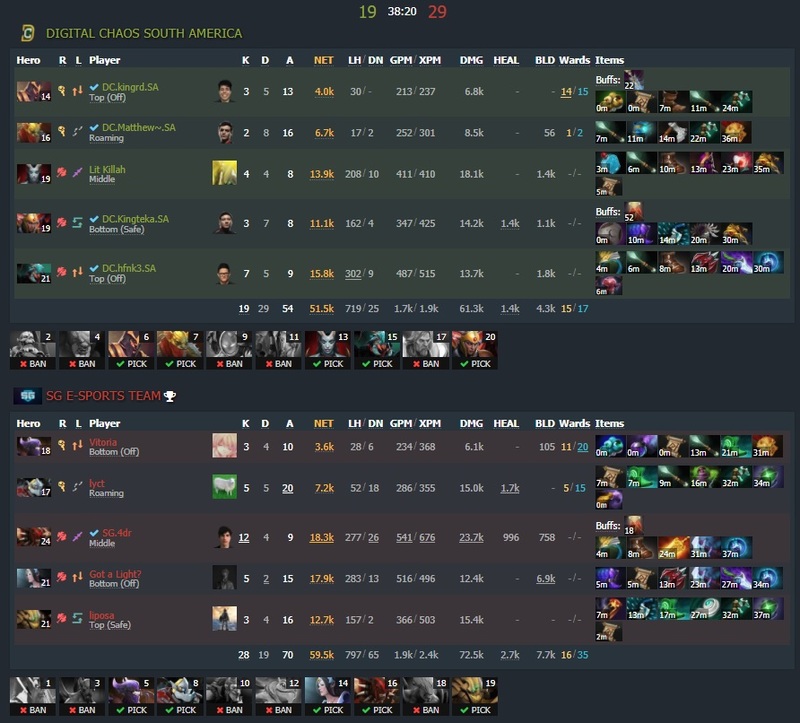 Infamous fought in the SA qualifier of DreamLeague S8. They earned a ticket for the Major after beating all opponents in the double bracket.